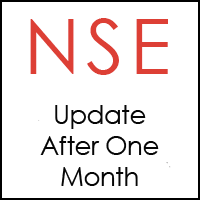 I just want to update you on the niche website I started in July. At the time I’m writing this, it’s almost been a month since I launched and I’m already ranking for the main phrase I’m targeting. In case you missed my initial post on my website experiment, my goal is to rank on the first page for my target phrase. I’m conducting this experiment to see just how challenging ranking will be starting from scratch under the New Era of Google. I realize it’s fairly early and I considered waiting before reporting (new sites always fluctuate), but everyone has been asking me how my experiment is going, so I thought I’d share. And just to be sure I was not getting personalized results, I confirmed this rank with Google Webmaster Tools. 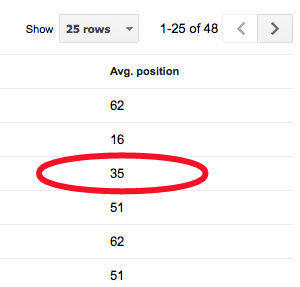 The screenshot below shows the average position (#35) for my target keyword. For the past week, it’s been showing on page 3 (position #28 – #30) on every computer I check, but remember everyone sees different rankings now, so I rely on the Average Rank that is reported by Google Webmaster Tools. If you are new to search engine optimization and want to learn more about what Google looks for today, make sure you watch my most recent SEO video here. As you can imagine, I’m not getting any traffic from this keyword yet because most people never get to the 3rd page of results, so no big surprise there. In fact, all the organic traffic (about 150 visits in the first month) is coming from long tail, less competitive keywords (4-6 word phrases) that are mentioned in various articles. About two weeks ago I noticed that Google made another update which seemed to favor the well-known brands in this niche. So many of the lesser known brand sites that were ranking well when I started this experiment are now either non-existent or on the 2nd or 3rd page. The top 10 is now made up of more solid brands. This isn’t typically good news for new websites — so I honestly wasn’t expecting to see my site ranking this high yet. So you’re probably wondering what I’ve done so far. As I mentioned in my 2nd update about a month ago, I am just focusing on writing content and I did publish a few YouTube videos. I have a Twitter and Pinterest account, but haven’t really done much worth talking about there. I’m up to 19 pages of content. That includes a static homepage and a menu that links to more static pages. I am using the silo method to arrange my content, which means the main menu items link to landing pages that include links to other pages as opposed to sorting my content like a traditional blog (by date and category). I am working very hard to make sure my content is written in a very natural way and I don’t repeat my main keyword phrase too often in the content. Today it’s very important to use variations of your targeted phrase in your meta titles and copy so Google doesn’t slap you for over optimizing. And since my target phrase is in my domain name (it’s a partial match domain, not exact), I really want to be careful of repeating the phrase too often. I only have 2 pages that really target my main phrase — the homepage and one other page. The rest of the pages are on related topics. Some of those pages may mention the phrase or variations of the phrase but I do not have a lot of pages solely targeting my main phrase. Again, I want to be very, very careful of over optimization. I’ve heard varying opinions on this so I’d love to know what you’ve discovered. In my experience, longer pages (750 words or longer) tend to rank better than shorter content. I’m not saying shorter articles don’t rank, but they seem to require a lot more social media shares. After beefing up some articles on my other sites, I’ve been able to improve the rank of many pages. Perhaps that has more to do more with freshness, so it’s hard to know for sure. Anyway, I’m ensuring most of may articles on this new site are fairly long with lots of sub-titles and images to make reading easier. As I mentioned in my last post, I am not planning on doing much in the way of monetization right now. No Google AdSense and very, very few affiliate links. Ironically, one of the links has already converted — even with such little traffic. That shows you the power of narrowing your niche. It often takes less traffic to convert sales. I have no idea if minimal monetization is going to give me any SEO advantages, but since I’ve never done this before I figured I’d try it out. It certainly won’t hurt anything. One tip people often forget (especially on traditional blogs) is deep linking pages when relevant. Even though the impact may not be as strong as years ago, they still play a role in SEO. Every time you link to a page, that is a vote for it in Google’s eyes. And even though an external, relevant link is much more valuable, internal links still help. Just make sure you vary your anchor text. So if you create a page that targets “how to shop at thrift stores”, look for relevant places in other articles to link to that page, but don’t use the same anchor text. One link may read thrift store shopping tips while another might read what you need to know about shopping at thrift stores. And some links may not have any keywords at all. You might just use click here for more information. So many people are still stuck on 2010 SEO techniques and overdoing it when it comes to their anchor text. Abuse this and you’re asking for an over-optimization penalty. This won’t come as a surprise if you read my post from earlier this year, but I think SEO plugins are highly overrated — especially if you know the basics of SEO. The only plugin I have that is SEO related is the Google XML Sitemaps plugin to ensure Google is immediately notified of any new pages. My theme has its own SEO meta tag and additional settings. That’s enough for me. Speaking of my theme, if you’ve been thinking of getting The Genesis theme, now’s the time. They just launched 2.0 last week with better, optimized code — which is always best for SEO. Just don’t let the hype fool you. No theme alone is going to give you a gigantic SEO advantage, but even Google admits that clean, optimized code is always ideal. Overall this experiment is going how I expected for the most part. I don’t have a lot of organic traffic and didn’t expect to. Years ago I probably would have had a lot more, but this is a new era. With no quality backlinks and the site being fairly small, no surprises here. One thing I will reinforce is GO DEEP with your niche and take your time with research. Many of you know I absolutely HATE the research phase, but if you want any kind of Google traffic it is a must today. Start with fitness then narrow it down to a specific kind of fitness or exercise. Yoga, for example, is still too broad so go even deeper to something like yoga poses for beginners. Get my drift? Also look at the competition in Google and see how strong the rankings are. Don’t just rely on keyword research tools. They are NOT enough. Long Tail Pro is great but you need to do physical research too. If you see a lot of sites like Yahoo Answers, HubPages, older articles, etc. ranking in the top 10, that’s a sign there may be some room to compete. However, if you see too many big brands, you know the task will be more challenging. But you MUST start with a defined niche. Many of you are trying to cover too much ground. You’ve got to stay focused — especially in the beginning. Remember, if you try to target everyone, you target no one. Well… that’s it for this update. I will keep you posted! 🙂 Don’t forget to follow the main page of this website experiment so you can stay up to date. I totally agree with you that Don’t just rely on keyword research tools. Tool can give us hint and way to work out but self assessment and experiment is most important. Thanks for sharing such intelligent info. Hmmm… I have to disagree about not using WordPress SEO. I couldn’t live without the snippet preview, SEO titles, the ability to modify meta descriptions for categories, or the page analysis. I am working a niche tech and i heard that there is lot of competiton in tha niche, but seriously i need some tips. I don’t want to give up and i will not. I am following you on you tube from past 1 month. I hope to get some tips from you. Love your post. Please I want to find out if you used social media to drive traffic to your niche experiment site. Really effective points. I have been following them since last one month and getting nice Alexa. Thanks for sharing it :). Awesome post I really love the fact that you are tracking your results in the search engines and not just working in the dark. I am working on a new approach to creating niche sites. I have had some success in the past with it, but it still need some work. The problem I have always run into is the time it take to see results so I decide to build an audience while my blog is in pre-launch mode using lost cost strategies based around P.P.C. I don’t do backing linking anymore because it’s to risky and expensive to have your business in Google Hands or hanging in the balance of the next major update. As always you knocked it out the park. I have followed your tips and have learned so much from you! Thanks for sharing your experience with us. I’m experimenting with blog commenting at the moment for one of my niche sites. I have noticed that you get a good mix of links, both follow and nofollow and it is the most natural, Whitehat method of SEO and traffic generation. I’ve been following your posts about your niche site. I came across the Niche Site Duel page 1 day too late – The Competition had already started. Hopefully Pat Flynn will run another one next year. Lisa your experiment is inspirational to everyone especially to me.I read this article from top to bottom and note some interesting points.These are implemented on my blog. The depth your covered in this post is really appreciable, it think one can right a complete book to cover all the details. a hearty thanks to you, as you the guidance from you experts give a light to grow for beginners. It looks like your site is progressing nicely. I’m so glad to see bloggers who are dispelling the backlinking myths. Looking forward to your next update. I’ve been looking for info about how to make the Genesis Prose theme wider. I’ve notice that your’s is wider than the default, looks like about a half an inch or so. I’ve yet to have any luck finding a easy to understand tutorial on how to do it and I wonder if you might have a resource that you can point me to that will take me through the steps? I know that making the theme wider may take a bit of doing but I’m willing to put in the time if I can find a simple tutorial that explains it. It is? I promise I haven’t done anything but upload a custom header. I haven’t adjusted the width at all but I would start in the stylesheet and look for the “container” style. On a similar note I really hope to do a webinar on customizing Genesis themes — especially now that they have upgraded to HTML5. That’s on my to-do list. Thanks for your prompt reply, Lisa. After doing some more digging, I finally did find a resource that would help me. However, as I anticipated, it would take quite a bit of work and I don’t think I’m ready to open that can of worms just yet. Also, I did some back tracking and realized that your theme actually is the default size. I just had my browser window size inflated on your blog for some reason, LOL. I would definitely second you doing a Genesis webinar. I would definitely attend and help promote it. One thing that’s been really irking me about Prose is that I can’t put a feature optin box in my header (after the banner display) without it looking funny. Right now I have a long optin box from Aweber front and center, below my banner, but that’s not really how I want it to look. I’ve tried the “header right” widget which displays my optin box right over my current blog banner. This looks weird and isn’t what I want. I’ve also tried using the “header hooks” and that displays right after my blog banner but I can’t figure out how to get it to look right, thus the long Aweber form you see. I’d like to have an image or something of the left side with an arrow pointing to my optin box on the right side. Or at least a decent looking horizontal optin form if I can’t have dual sides. I’ve spent an insane amount of time trying to figure out the whole horizontal optin box and CSS code thing for Aweber and still haven’t gotten it to do right, LOL. Ah, well, I’ll keep trying. As much as I love WordPress it is still not easy to manipulate/add things like this without getting knee deep in code. I wonder if it will ever get that flexible but I sure hope so. I’m assuming you’ve installed the Genesis Simple Hooks plugin right? Did you try that route? Really enjoyed this article, I’m glad we’re in agreement about anchor text. I have been conciously “underdoing” it in places to offset any aggressive techniques I might have used in the past. I recently lost my pagerank after a 301 redirect and I’m wondering if I’ll get it back. If this is a hard reset for my blog so be it. Great tips here! Keep us updated on how this niche website does, and if you decide to really monetize it, let us know how the conversion rates are! Nice update! Please continue to keep us posted. About a year ago, I started a QuickBooks tutorial site (http://www.WhatIsQuickBooks.com)and ranked well for a while but then it went into a free fall. I suspect this might have been due to some over optimization, just not sure what happened and haven’t had the time to put into it. Also, I like the concept of maybe digging deep with my niche, that’s something I hadn’t really thought about. I may also look for ways to re-purpose or broaden my content. Been following you and Pat for a long time and have created niche sites in the past, but focused more on the keyword research numbers instead of what I’d be interested in talking about. Those sites suffered as a result..I’d pick some obscure topic that was incredibly boring to me. I decided this time it would be different and I would focus on a topic I have been meaning to cover, focus long tail keywords, provide helpful information, and work on ways where I don’t have to rely on Google. Like you, it will be an interesting test. Haha, same for me! I hate it… soooo boring and excruciating. I wouldn’t say it’s such a problem to rank a niche site in 2013. Fundamentals didn’t change. With great research you still can find a great url and keywords, and rank without lots of hard work. Thanks for your helpful topics. Please check out http://www.pepboysoilchange.com to see if I am on the right path. You barely touch the surface of your experiements. Can you give us the Google Analytics printscreen, teach us the backlinkings methods, where you get your posts from, etc … I’m going to follow your progress and see if you can hit the no. 1 spot! Thanks for the useful post. As u told deep linking of the pages is very important. Can u please suggest me some tips for creating blogs..
First of all Congratulations for your Niche Site, and thanks for sharing your information. mostly bloggers don’t share the Information but you do, so i Appreciate. Thanks for sharing post. i always love to these types of informative articles. I know you don’t like the idea of a “free site”. Here’s a possible exception. Using it for a test sight before launching your business site. I’m always stumbling on the technical side of things and getting disappointed when something backfires. This free site is not just playing around, but recording what works and what doesn’t. I like what you said about article content versus length and relevance. Documenting will help with focus and sharing it later will add value to the business site. You’re right on calling this a “people” business. Working with this free site will help me be better prepared when I redo my current (real) site, which turned out “clunking” yet again. I’ll just bet your experiment will turn out doing better than you realize. I don’t know of anyone else who puts out better quality and helpful content than you. Even if I do end up stumbling. Sometimes the best lessons learned are the ones earned. I’ll keep trying to earn my learning and appreciate your wisdom. Thanks for your unique way of sharing. The part that I hate most is finding a domain name. I am considering a new exercise blog chronicling my lifestyle change from coach potato to gym rat even though I absolutely hate exercise. For the life of me, I can’t think of a domain name. The domain name Ihateexercise.com will cost me a cool $899. Uh, no. Thanks for reminding me that I can go play around with keywords to help me find an efficient domain name. I am an editor of Brazil, his articles have helped a lot, thank you! Hi Lisa..Thanks for sharing this type of useful content..I am the regular reader of yours. Keep the good work gong on…I also have such a technical blog http://www.webcodeexpert.com/. I usually use your tips in improving my blog. Since you asked, and with the understanding/disclaimer/waffling that I don’t really know what I’m talking about, I will say this: I only ever wrote one article on my blog that was SEO optimized. It was very long but, because it was so targeted (could not find CAPTCHA – no quotes), it ranked #1 or #2 for months. The reason is that it was related to a plugin that was actively being developed. Every time the developer updated the plugin, the same piece of code “broke”, requiring a detailed fix. Anyway, as I said, it was a long post. I really don’t think length matters as long as you are solving a problem. Of course, that may be irrelevant to the heart of your question, since I got my traffic based on keyword, not whatever measurement Google may or may not be using to rank my article based on length. See? I told you I don’t know what I’m talking about. LOL, Mitch you crack me up. I think you make a good point though. The length is probably not as important anymore because it’s more about the big picture — quality backlinks, the amount of competition for the keyword, and social shares matter the most. Hi Lisa congratulations on doing so well and sharing all your information with us. I am about to set up a site on health and fitness for the overfifties, I know its broad but I want fitness videos and food guides really have to be included.Lets hope all the good content will rank it high. Thanks again for spreading your knowledge. Well the fact that you’ve narrowed it down to over 50 is good. At list you have a smaller niche than just fitness. Good luck! Ah you’re definitely doing better than I did my first month for my current website, haha. I’m really happy that you’re actually getting some good rankings so early. Just wondering: how was building this website different than the other niche experiment you started in 2011 (I think 2011?). Was it harder to be successful or about the same? Jay, this site is hardly “successful” and we’ll see if that rank even holds. In fact, I think I’ve gotten traffic much faster before in 2011. I can definitely tell things are different and that this is not going to be like any site I’ve created before. Hey Lisa! Keep in mind that this is not 2011 – everything that “worked” then in the way of traffic attraction, SEO and PR rank boosting, etc. works no more… and funny as I write this I noticed today a huge traffic increase on one of my blogs via a “newsreader” site which must have just added me… these days you just gotta make your blog the best original work it can be, stay away from the guest posts, and cross your fingers! Blog On! Oh for sure! As I said in my original post last month, this is going to be a lot harder because times have changed. I never did any of that PR rank boosting stuff anyway. Very informative post. I agree with a lot of your points in this case study. What would be your view on a scenario where someone wants to write about different niches such as personal finance, fitness, cooking etc. Would one website with all these niches togeather such as squidoo etc. be better or different sites with one niche on each? I’m interested to hear what your opinion would be on that! I would love to hear your opinion on this. I have the same issue, and was going to create a whole new blog/domain for each. My planned blogs are different niches same broad topic – dog breeds. I am diligently following your case study, Lisa as I love how you catalog and detail the process required for a new niche site set up. Plus I haven’t created a new niche site in a while, so am doubly curious as to the process in 2013 and beyond. My big issue is always KW research, I like to (think) I am good with it – but in reality I get stuck with how to use variations of phrases in my niche. For example, let’s say I am going for a phrase such as small sunglasses for women and from looking at the KW tool I see a few phrases to additionally target. I get this. What I don’t get is how to vary it up when it comes to the phrases people are finding me by when I check my stats. Should I use these same exact phrases people are using to find me and include them in the current post, or create a (new) one entirely? I hear ya Missy. I don’t claim to be an expert at this stuff either (especially the keyword research). Although I did spend a little more time on this for this because SEO is way different and more challenging now. I’ve always been who has naturally earned backlinks over time so all this attention to detail is very new to me. I’m one who just prefers to write, but I know it’s a different time now. If I see that I’m getting found for keywords I am not necessarily targeting I may create another page for that phrase IF the demand looks good. I’m just surfing on net and found your blog. Your article just make me stop and read your article. Your article is so interesting and knowledgeable. Looking forward for your next article. I just love your articles. So informative and so full of knowledge. Just a thing I wanted to mention. Are you warning against the usage of SEO by Yoast ? Coz I already have it installed in my WordPress blog and I think it’s giving good results. No not at all. I think Yoast is fine as long as you keep your expectations into perspective. Didn’t get you..could you please explain? I have 60 posts on my website and all of them not overly optimized , good , unique articles(LSI included) . I have bookmarked all of them using my bookmarking accounts . Most off them in the top 100 but this is not giving me anything . they have to be in top 10 and for that you gonna need back-links . I really liked the news about LSI keywords when I’ve heard it first time . i though ‘super I don’t need building back-links and get traffic ‘ . Not . Reality is that you going to have to learn the hard way to rank your sites and pages . There is no easy way . Period . Yeah the backlink part is NOT what I’m looking forward to. In the past I’ve always earned them instead of chasing them. So if it comes to that, this experiment will end. I’m just not a backlink chaser. Boooooooooring. Hi Lisa, I watched your video on youtube about SEO in 2013 and absolutely loved it. I hope your niche site experiment goes well. Since you have mention silo structure, I have to ask this. I don’t find wordpress a good CMS for silos. What is your view? I would also like to know about the theme you are using if that’s possible. I’m using the Focus Theme. The link is in the post. You might have missed it. No, WordPress is not a good CMS for silos but you can fix it pretty easily by creating a custom menu and choosing what pages you want to link to. great article every time i learn something after reading each of your post and its very helpful with me i also watch your video “getting google traffic” and i hope it will help with me thanks for sharing.